Been in The Matrix? Now take the next leap of understanding with The Matrix Revisited. Experience the nuts, the bolts, the creative thunder of the cyberthriller that thrust moviemaking into an astonishing new dimension with never-before-seen footage from the original movie and exclusive reflections by those who lived it. Then go deeper with a look forward into the reality that is unfolding in real time: the sequels simmering to life at hidden locations around the world; an eye-popping first glance into The Matrix Anime - new dimensions that explain more about The Matrix. The Matrix Revisited is the who, what, where, when and wow of a phenomenon that has just begun. It will make you dream in bullet time. DVD: Standard 1.33:1/16X9; audio English Dolby Digital 5.1; subtitles English, French, Spanish; closed-captioned; single sided - double layered; 33 chapters; Not Rated; 123 min. ; $19.98; street date 11/20/01. Supplements: “What Is to Come?”; “Whatisthematrix.com?”; “What Is Animatrix?”; “The Dance of the Master: Yuen Wo Ping’s Blocking Tapes”; “The True Followers”; “The Bathroom Fight and Wet Wall”; “But Wait - There’s More”; Hidden Features. So it’s come to this. Our mania for supplements related to movies means that we now find separate DVD releases that include nothing other than these kinds of features. They aren’t “extras” anymore; on The Matrix Revisited, they’re every course of the meal. And that’s more than fine with me. After Warner Bros. announced the release of Revisited, a modicum of griping ensued from some parties. Many of these confused folk whined because they felt WB was “forcing” them to repurchase the movie. To that I respond: huh? For one, no one ever requires someone to replace an old DVD. Sure, many reissues are very appealing, and fans of those films undoubtedly will want to “upgrade”, but if you’re happy with the old one, no guns are placed to heads to force the new purchase. In this case, the complaints seem even odder, because Revisited isn’t a re-release of The Matrix. One and only one version of that DVD exists: the same one that hit the shelves back in 1999. Revisited complements that package, but it doesn’t replace it, and it’s not a required purchase for anyone. The DVD of The Matrix already included lots of extras. 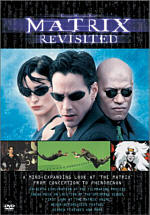 Revisited exists to supplement the supplements, and seems aimed at the heavy-duty Matrix fans. Don’t take that as a criticism, though, for the program offers a terrific look at the film. The format follows a standard documentary design. Some clips from the movie appear, as well as lots of behind the scenes footage and interviews with participants. In the latter category, we hear from writers/directors Andy and Larry Wachowski, cinematographer Bill Pope, editor Zach Staenberg, production designer Owen Paterson, President of Warner Bros. Worldwide Theatrical Productions Lorenzo Di Bonaventura, producer Joel Silver, actors Keanu Reeves, Laurence Fishburne, Hugo Weaving, and Carrie-Anne Moss, storyboard artist Steve Skroce, conceptual artist Geof Darrow, visual effects supervisor John Gaeta, kung fu choreographer Yuen Wu Ping, costume designer Kym Barrett, Peter Doyle of effects house Dfilm, associate visual effects supervisor Janek Sirrs, sound designer Dane Davis, composer Don Davis, and music supervisor Jason Bentley. All of them appear via new interviews, many of which come from the set of the sequels. In addition, we see one 1997 clip of Di Bonaventura in which he presciently relates the impact he felt The Matrix would have. Revisited provides a very rich and full examination of the creation of the movie. Appropriately, it starts at the beginning and relates some interesting material about how the project came to fruition. For example, I had no idea that the Wachowski’s first film, 1996, actually was developed after they’d already initiated work on The Matrix. Apparently they needed to prove themselves as filmmakers, and Bound was the project that gave them something on their résumé. From there we go to other pre-production elements like the incredibly rich and detailed storyboards and additional conceptual art. However, most of the program deals with the actual shoot itself, as we hear lots of great information about the production. Until we reach the point where the actors become involved in training, most of the show used film clips and “talking head” interview snippets; other than the various art, little “behind the scenes” material appeared. However, that changes once we get to the martial arts training through which the actors had to go. From there until nearly the end of Revisited, the documentary more equally splits between the interviews, the behind the scenes shots, and the movie snippets. Happily, the latter are never used gratuitously to fill space. Instead, when we see a clip from the film, it’s there to illustrate the discussion, and even folks who know The Matrix well should like this method. Nonetheless, the other elements are the prime attraction here, and they’re almost uniformly excellent. Though some praise is doled out to participants, Revisited never resembles a happy talk festival, and the focus remains on the actions, not the subjective appraisal of the work. Pretty much every element of the production receives attention, though the show spends a surprisingly short amount of time on the visual effects. To be certain, Revisited discusses that work, but considering the effects-intensive nature of the production, I thought the show would cover them in greater detail. Not that I mind, for too often, documentaries about effects-heavy movies become bogged down in technical jargon and we learn too little about the rest of the process. That definitely doesn’t occur during Revisited, as it touches nicely upon all the other areas. The actors weigh in with their approaches to the film and tell us about the various difficulties, prime among which was Reeves’ neck injury; interestingly, though this could have paralyzed him, he seems to shrug it off and not really view it as a big deal. Reeves takes his lumps as an actor, but you may leave Revisited with a new appreciation for his dedication and work ethic. Throughout the show, we discover how hard he worked on the project, and his attention to detail seems strong. Of course, we hear about the other actors as well, and all offer their insights about the process. Revisited deftly inserts comments about other subjects as well, as it covers every major aspect of the production. Possibly my favorite sub-domain was that of costume design. Kym Barrett goes beyond a simple discussion of visual motifs and gets into nice details about her choices; it’s a topic not often visited in these sorts of shows - especially for a movie like The Matrix - and the material adds a lot of depth to the piece. The behind the scenes footage contributes an excellent layer of involvement as well. While we hear the reflections about the process, we see the film as it was shot, and these elements seem very worthwhile and interesting. Revisited largely goes through the movie in the order it was filmed, and it tends to break down the subjects into specific scenes. For instance, one area covers the dojo fight, while another goes over the government lobby sequence. This compartmentalizes the topics neatly, but it doesn’t isolate them; the program flows well from subject to subject. The show gives us a very detailed look at the various fight and action scenes. Toward the end, we get information about the reactions to The Matrix. The participants provide their thoughts about the final product - not surprisingly, these are all positive - and they cover audience opinions as well. In addition, we get a little information about the simultaneous production of the two Matrix sequels. No substantive information about those flicks appears, but it offers a decent teaser nonetheless. Overall, I was very impressed with The Matrix Revisited. Coming two years after the original DVD and all its substantial extras, one might think there are few stones left to be unturned, but Revisited offers an excellent summary of the production and it gives us a terrific amount of good information. All of the facts are related in a clear and engaging manner, and the documentary consistently kept me entertained and involved. The Matrix Revisited appears in an aspect ratio of 1.33:1 on this single-sided, dual-layered DVD; due to those dimensions, the show has not been enhanced for 16X9 televisions. Actually, I should clarify the aspect ratio. All of the interview and behind the scenes shots were 1.33:1, while the movie clips offered their natural 2.35:1 ratio. Overall, Revisited seemed watchable but flawed and fairly bland. Most of Revisited was split between videotaped interviews and video footage from the set. The latter looked roughest, as the caliber of equipment used didn’t appear to be terribly high. The interviews were somewhat clearer and more accurate, but they didn’t seem all that much better. In general, the show looked somewhat soft much of the time. Sharpness generally was acceptable, but it tended toward the fuzzy side of the street and rarely developed a very crisp and detailed impression. Some jagged edges and moiré effects occurred, and I also detected a few examples of edge enhancement. The image yielded some video artifacts as well; these occasionally gave the program a moderately grainy appearance. Colors looked acceptably accurate and realistic, but they suffered from the vaguely drab tone of the program. The hues came across as somewhat flat and lackluster, though they didn’t seem runny and significantly problematic; they just lacked much vibrancy. Black levels appeared similarly bland, and low-light sequences seemed a bit muddy and murky. Overall, Revisited remained consistently watchable, and a lot of my concerns related to the relatively poor quality of the material from the set. Nonetheless, it still seemed like a fairly weak visual presentation. Audio quality appeared superior but unspectacular. The Dolby Digital 5.1 soundtrack of Revisited was very music-heavy. In fact, except for the music, the soundfield almost never used anything other than the center channel. Even the movie clips appeared to be essentially monaural. One of the few instances of side-speaker usage occurred during a sound design demonstration; otherwise the track stayed strongly in the middle. The music showed a greater presence, as it played a heavy role in the proceedings. The techno score could be heard through virtually the entire show. Don’t worry - it didn’t cover any interviews or other important information. It usually stayed in the background, and it remained firmly behind the auditory elements we needed to hear. I thought the show went a little nuts with all the music and could have lived without so much of it, but it didn’t cause any problems. The score mostly showed stereo separation in the front, but the rears bolstered it with light reinforcement. Audio quality appeared generally fine. Speech consistently sounded natural and distinct, with no signs of edginess or problems related to intelligibility. Some of the dialogue was a bit rough at times due to the recording circumstances; the footage from the set didn’t seem as clear as the interview clips. Nonetheless, the speech still sounded good. Effects demonstrated positive characteristics. Mostly we heard these either as parts of the movie clips or via aspects of the behind the scenes shots. The former weren’t as bold and vibrant as they would be on the real Matrix DVD, but they still seemed fine. As with the speech, the elements recorded on the set lacked great depth or definition, but the program displayed them with acceptable accuracy. As for that omnipresent music, it showed nice breadth and fidelity. The score came across as clear and bright, and it offered good dynamic range. Low-end response seemed reasonably deep and rich. The music rarely got a chance to “show off” because it stayed in the background, and it worked fine within that realm. Revisited provided audio that worked well for the material. A few materials supplement the main program. What Is to Come? takes a superficial look at the upcoming Matrix sequels. During the first 105 seconds of this two minute and 45 second snippet, we see raw rehearsal footage for the flicks, accompanied by the usual techno music. The final minute provides comments from David Perry, president of Shiny Entertainment, who covers some of the issues related to making a video game for Matrix 2. We see a few shots of fight motion capture and hear how cool the game will be. This piece was short on information and long on promotion; don’t expect to learn anything useful here. What Is Animatrix? fell into the same category. In this five-minute program, we learn of the anime spin-off of The Matrix called Animatrix. The show features comments from Joel Silver, Animatrix producer Michael Arias, and Animatrix directors Yoshiaki Kawajiri, Takeshi Koike and Mahiro Maeda. Again, this clip let us know how terrific the series will be, but outside of some conceptual art, it didn’t deliver much practical information. Another largely promotional piece, Whatisthematrix.com? gave us 90 seconds of comments from Silver about what an amazing site that one is. It also touted upcoming features to urge us to visit. I’m sure it is a cool site, but this program didn’t tell me anything else. Much more compelling was The Dance of the Master: Yuen Wo Ping’s Blocking Tapes. In this five minute and 50 second program, we watched the preparatory video created for four scenes: “The Dojo Fight”, “The Subway Fight”, “The Government Lobby”, “The Bathroom Fight”. The first two dominated the clip, and the others took up much less time. This was a great look at the planning of these segments, and it offered a very useful experience. During “The True Followers”, we met some of the movie’s fans, all of whom came together over the Internet, apparently. Consisting solely of material from these “Internet fans”, we heard from “Kira”, “AKS”, “Kyote”, Johanna, and “Lucid Dream”. Some of them were borderline creepy, and the program existed mainly to let us know what an incredible fan network the movie built, but it was moderately interesting. Better still was “The Bathroom Fight and Wet Wall”. This 195-second clip looked just like something from the main program, which I assume it was and just got cut for unknown reasons. It should have stayed in Revisited, for we got a good impression of this particular scene. We heard from Owen Paterson, Bill Pope, the Wachowskis, Fishburne and Weaving as they related information about how this segment was shot. But Wait - There’s More finished the extras with a montage. Similar to “What Is To Come?” this 190-second piece showed a mix of behind the scenes shots, effects footage and other elements, all of which was backed by the standard techno score. It offered enough interesting shots to merit a look. The DVD’s case lists Hidden Features, and the press release states that it includes “188 minutes of music and seven minutes of concealed bonus video materials”. Those claims seem to be accurate, as we find when we open the various “Easter Eggs”. To discover the secret music, go to the “Languages” page. Highlight any of the “subtitle” choices and click to the left. This will reveal a phone booth; click on it and you’ll gain access to a whopping 41 electronic tunes. If you click to the right again with the “woman in red” highlighter, you’ll see an image of Agent Smith. Press “enter” and you’ll learn about Hugo Weaving’s on-set physical problems. We hear from Weaving, Reeves, and Fishburne as they briefly discuss the issue in this 90-second piece. If you move to the second “Go Further” screen, highlight any of its options and click to the right. This reveals an alternate shot of Reeves. Press “enter” and you’ll see a two minute and 40 second clip with some behind the scenes material and a short discussion of some of the movie’s themes. Finally, we get an egg within an egg! On the second page of the secret music choices, click to the right from any of the songs. This reveals a bullet; click on it and we see a fullscreen trailer for the film. To my surprise, The Matrix Revisited didn’t include any significant DVD-ROM materials. I expected some goodies in that department, but instead, it only provides some Weblinks. We find connections to the Warner Bros. “Special Events” page as well as WB Online. In addition, we can head to the movie’s original website, learn about the studio’s latest releases, and sign up for “Movie Mail”, a feature that will contact you with new WB information. I don’t know how much of a market there is for DVDs devoted purely to supplements, but The Matrix Revisited shows that the format can work. The disc complements the fine DVD of the film itself with an excellent documentary that covers virtually all areas of the production. It does so in a thorough and engaging manner that made it consistently entertaining and compelling. Picture quality seemed somewhat weak, but the show remained perfectly watchable at all times. The program’s soundtrack appeared serviceable and fine for the genre, while the extras helped round out the main documentary. Fans of The Matrix will definitely enjoy The Matrix Revisited and should give it a look.